1 / 15 Upper deck with fantastic views! This is a wonderful townhouse with a large deck that sits directly on the beach. Just step off deck and sink your toes into the shimmering white sand of beautiful Panama City Beach! Or sit on deck, cook out, and enjoy the awesome sunsets with family and friends. 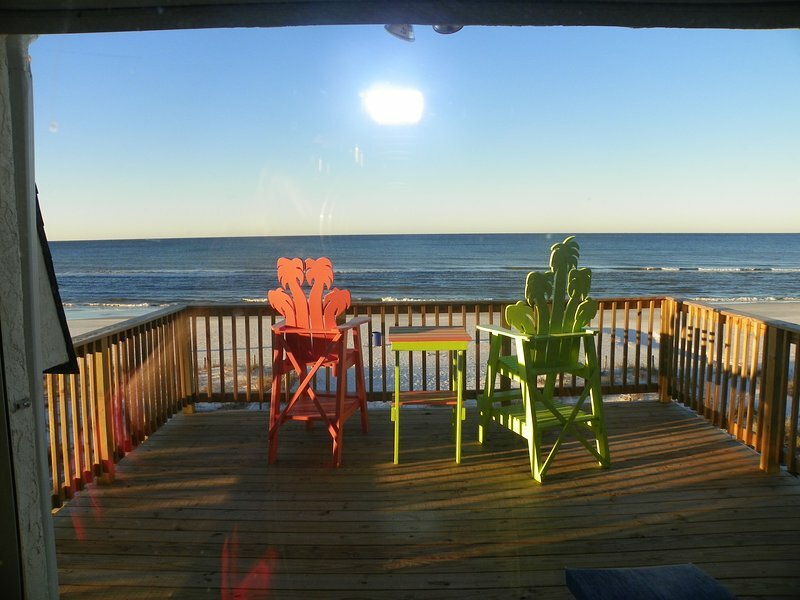 Also, from the upper deck you can experience one of the most beautiful panoramic views on the beach. This beautifully furnished home has all amenities including stainless appliances, wet bar with ice machine, and full size washer and dryer. Downstairs has all ceramic tile with one bedroom with full bed and one bath. Also, a sleeper sofa in living area. Upstairs has hardwood floors with tiled bathrooms. Two very spacious bedrooms each with private baths. Master bedroom has king bed, second bedroom has a king bed and a full bed. This townhome is located in a low traffic area and convenient to Walmart and most all attractions on the beach.